If you've spent much time developing applications on Microsoft's latest and greatest UI platforms (that'd be Silverlight and WPF for anyone wondering), you know that one of their weakest points is tool support. 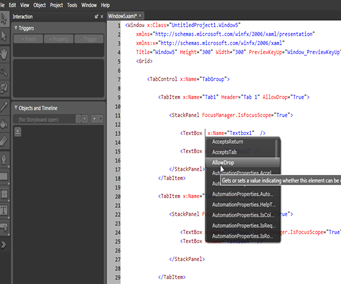 VisualStudio provides a great XAML coding environment complete with IntelliSense, but it has a designer that is little more that a preview image- you can't interact with it at all. Expression Blend has a great visual designer for XAML, but try to modify the markup and you'll quickly remember what coding was like before IntelliSense <shudder />. Together, these tools form a pretty complete environment for development, but sometimes it would be nice reduce the number of times you have to bounce between Blend and Visual Studio.